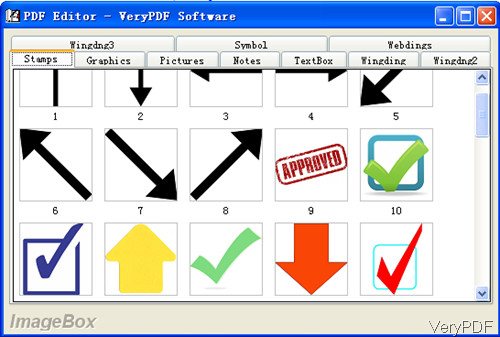 VeryPDF PDF Editor is an application allowing you to edit PDF and convert PDF to image. Now it has been updated to version 4.1 with more powerful function, annotating is one of them. Maybe you are not strange of the workflow like a collaborator sends a draft proposal or contract to us then we will read it carefully and send it back. We may use Big Red Pen on hardcopy to add some annotation then return to the lead author by scanning with scan machine. 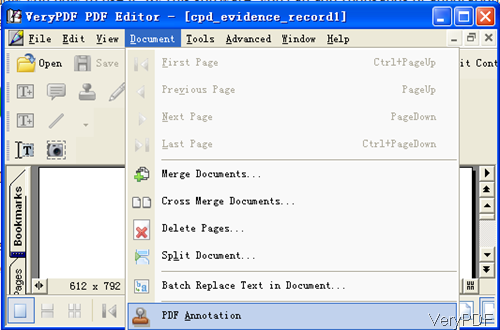 In this article, I will take one of the function of annotating PDF for example to show you how to use it. By this software, you can add thousands of annotations to PDF file. Then the signing on paper and scanning step can be saved. PDF Editor is GUI version, so when downloading finishes, there will be an exe file in the downloaded package. You need to install it by double clicking the exe file. The installation takes a few seconds then you will see an icon showing up on the desktop. Please double click the icon then you can launch this software. When you launch this software whose interface looks like the following snapshot.Please click option File to choose Open. 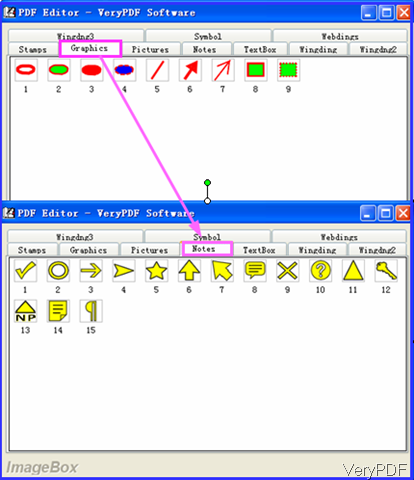 Or simply click option Open to add file to software interface. You can drag file from its containing folder to software interface. Please click option Document then you will see the dropdown list. Please choose the last one PDF Annotation. When you click that option then you will see the following dialogue box.There are ten sub-tabs in this menu option. The following snapshot is from Stamps tab. In his tab, there are many kinds of arrows for you to choose.Meanwhile there are also many fonts stamps like Approved, AS IS, FINAL, SOLD DRAFT and so on so forth. In the following part, let us check those sub-tabs one by one. The following snapshot is from Graphics and Notes tabs. Here you can add all kinds of notes icon to the PDF file. The following snapshot is from the Picture tab and Symbol tab. 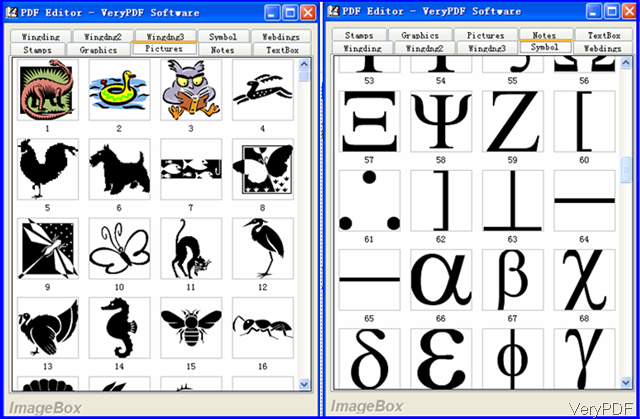 In the Picture tab, there are thousands of pictures for you to choose like dragon, snake, butterfly and others. By those pictures you can make beautiful and vivid annotation for PDF file, especially you are are eBook maker, the function of this software can help you a lot. In the Symbol tab, there are more than 400 hundreds of symbols for you to choose. By those symbols you can edit equations which you can not make in PDF document. When you choose the annotation icon, please double click it then it will be added to PDF file. In the view Window, you can move it from one place to another casually. After adding, please click option File then go to Save as. By this way, you can save it to a new PDF document. As there are too many, I can not list all of them here. If you need to know more, please download this software and check then yourself. During the using, if you have any question, please contact us as soon as possible. How to convert Type 3 font to Type 1 font in PDF? Can I print a PDF file from PDF Viewer OCX Control? How to do printing job after edited by PDF editor? How to draw an ellipse-shaped comment in my pdf file with VeryPDF PDF Editor? This entry was posted in PDF Editor and tagged annotate PDF. Bookmark the permalink.